The perfect window shading option, custom made by experts near your area. Roller shades are designed for two purposes. The first is as stand-alone fixtures to cover glass panels and windows, serving purely a design addition. Their second purpose is to provide additional sheer fabric covering for basic slatted blinds. This is done in order to add privacy. The simplicity of their structure offers simple elegance that many nearby home and business owners tend to prefer. Although less intricate than other types of window coverings, roller shades are incredibly effective at filtering sunlight in a straightforward way. So are light filtering roller shades right for your windows? Most likely - yes. These coverings have plenty to offer any type of room. Most window treatments, such as roller shades, offer features that provide added functionality and light filtering options. Installing these coverings over your home or business windows can provide you with more options for preventing light from seeping into a room. The functionality of roller shades also extends to adding more color and style that help brighten up a room and complement its decor. Modern roller shades are often designed with two types of window coverings. The first layer is the slatted horizontal panels followed by a sheer fabric covering to add more privacy when the slats are open. Both the slatted panels and the fabric covering can be drawn up to allow a wider view of the window. Roller shades can also be adjusted if you're more interested in privacy and protecting the room from harsh sunlight and potentially harmful UV rays. The material your rolling window coverings are made of determines a lot about their functionality and effectivity. Choose sheer roller shades for your living room and enjoy natural lighting for most of the day. Opt for blackout roller shades for your bedroom windows, and prevent early morning sunlight from waking you up and messing with your sleep on weekends. The variety of available sheer and opaque fabrics allows us to accommodate every person’s taste. You can even get bamboo roller shades if you’re looking for a “greener” shading solution that’s eco-friendly and energy efficient. Regardless of how close you are to us, if you're anywhere near the greater LA area, by scheduling a free consultation you'll receive all the answers you need to decide whether roller shades are right for you. Apart from the regular cordless roller shade version, you can also have these elegant window coverings motorized. Why should you? Because it’s incredibly convenient to use automatic covers for your windows, and there are only upsides to choosing them. 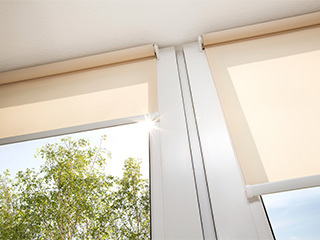 Motorized roller shades work by essentially replacing your physical input with a mounted motor. You use the remote to control the electric shades, or, if you opt for Somfy-powered roller shades or a similar modern variation, you can use your smartphone, or even voice commands. Smart motorized roller shades will respond to your input commands without you having to physically draw them. You can also get self-adjusting roller shades, which utilize special sensors to cover more or less of your windows during different times per day. Every roller shade set you get from us is custom made to fit the windows and/or glass doors they're installed on. Los Angeles Blinds & Shades knows it can be difficult to decide which type of window covering is going to be the best fit for your internal décor. That's why scheduling a free consultation with the nearest expert is the best course of action. Our products all come with a 5-year warranty, so you can rest assured that the new roller shades you get are of premium quality and will last for a very long time. Get in touch with us today and ask us any questions you may have.